Mercy James arrived in her new home in London to start a new life with mother Madonna and three siblings, Lourdes, Rocco and David. The baby girl, 4, arrived over the weekend and the first place she was taken to was a Kaballah meeting. Don’t really think it’s the best place for family bonding. Though Madonna won the custody battle in Malawian court, Mercy’s dad James Kambewa believes Madonna used her power to get the girl. My Mercy is gone. Madonna has used her money and power but my blood lives in Mercy for ever and ever. There is nothing I can do now,” he said. 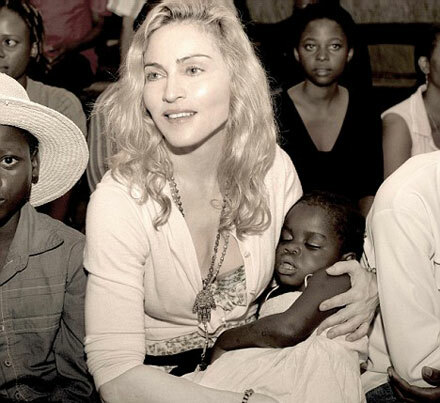 Madonna didn’t even have time to take Mercy to London by herself, instead she sent a private jet to Malawi and Mercy’s nanny took the girl to her new home. Again, seems like nanny’s gonna spend more time with the four-year old than the singing mother as Madonna is surely busy with her working schedule. Anyway, hope Mercy will be happy with Madonna. And welcome into the limelight, Mercy!